Paul García, MD, PhD, is an Associate Professor in Emory University’s Department of Anesthesiology. As a clinician-scientist, he not only works in the hospital as a practicing anesthesiologist but also manages an active laboratory research program. His background is in Neuroscience/Bioengineering and his clinical interests are in anesthesia for neurosurgical procedures and neurologic disease. Jon Fidler has been with the Neuroanesthesia Lab since “the beginning” in January 2011. 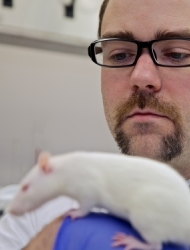 He manages the day-to-day workflow of the laboratory and conducts an array of primarily in vivo experiments. Previous to working in the Neuroanesthesia Lab, Jon worked for over 8 years in neuroscience laboratories at Genzyme Corporation in Framingham, Massachusetts and at Northwestern University in Chicago, Illinois. Edyta Murlin, PhD joined the Neuroanesthesia Lab early in 2014 as a resident electrophysiologist specializing in LTP in ex vivo hippocampal slices. Dr. Murlin’s work focuses on the effects on GABAergic currents upon application of various ligands, including antiretroviral agents. She received her MS in Physics from Adam Mickiewicz University, then completed her PhD in Biocybernetics and Biomedical Engineering at the Polish Academy of Sciences. Matthias Kreuzer, PhD joined the Neuroanesthesia Lab in 2015. His research focus is the analysis of electrophysiological recordings, such as LFP and EEG, to evaluate anesthetic-induced effects on neural network activity. Prior to joining the lab, Dr. Kreuzer worked in the Department of Anesthesiology at TUM in Munich, Germany for 10 years. He has received his PhD and two engineering degrees from the Technische Universität München. Iris Speigel recently completed her PhD studies in Emory University’s GDBBS Neuroscience Graduate Program, having successfully defended her thesis under co-advisors Dr. Garcia and Andrew Jenkins, PhD, in January 2017. She is currently specializing in biochemistry and live-cell imaging of GABAA receptor trafficking within ex vivo hippocampal slices and primary hippocampal neuron cultures respectively. She brings prior experience with electrophysiology and transgenic mouse colony maintenance. Prior to joining the Neuroanesthesia Lab in fall of 2014, Iris completed her undergraduate studies at the University of Maryland, College Park. Christopher Sinon is a 3rd year graduate student in Emory University’s GDBBS Neuroscience Graduate Program, having joined the Neuroanesthesia Lab following a rotation in summer of 2015. His research is focused on investigating how anesthesia effects cognition and neurophysiology in aged populations, integrating both in vivo data from rat models and computational study of EEG. Chris comes from University of Illinois-Chicago, where he received his BS in Neuroscience, then worked as a Visiting Research Associate for 2 years, before beginning his graduate studies at Emory. Nanditha Rajamani joined the Neuroanesthesia lab in 2016. She is a 2nd year Graduate student at Georgia Institute of Technology pursuing her MS in Computational Science and Engineering. Her primary research focus is geared towards computational analysis of EEG signals for developing robust data comparison and processing techniques. She completed her under graduation studies at Sir. M. Visvesvaraya Institute of Technology in Bangalore, India and obtained a BE in Biomedical Engineering. Daniel Kim is a freshman-year Emory undergraduate joining the Neuroanesthesia lab starting in early 2017. Daniel will be performing various tasks throughout the lab, focusing his research efforts initially upon in vitro models of anesthesia and use of molecular pharmacology to elucidate mechanisms of neurotoxic and neuroprotective effects of anesthetic agents and adjuvants. Diana Beschen has fulfilled a variety of administrative roles involved in coordinating the Neuroanesthesia Lab’s clinical and bench work both at Emory University and the Atlanta VA Medical Center. She joined the lab in late 2012 and, since then, has served as the point-person for planning both national and international conferences, in addition to her day-to-day duties. Diana attended Florida State University, where she received her undergraduate degree in Psychology.